There are two species of Eyed or Ocellated lizard commonly kept in the hobby, Timon lepidus and Timon pater. 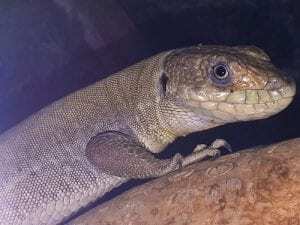 The former is the larger of the two, reaching around 60cm, and is the hardiest of the two species – it is often kept in secure outdoor enclosures even in Northern Europe (with supplementary heating), and is usually provided with a true period of brumation (hibernation). It naturally occurs in and around the Iberian Peninsula, mainly Spain and Portugal. Timon pater does not grow as big, around 30-40cm and is not a hardy species, it originates from the more Southerly geographical region of Morroco. For this reason it is more suited to indoor vivaria, the smaller size and lack of hardiness lending itself well to the average sized indoor enclosure in a centrally heated home. The following care is for Timon pater. 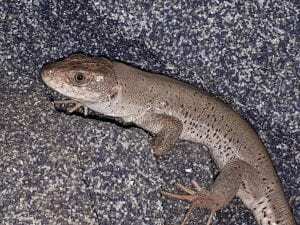 This species is not a tame lizard in the same ilk of a Bearded Dragon, however they are intelligent and do recognise their owner and associate them with food. For this reason they can become relatively tame, and not flighty, but they are not a species known for being able to be handled easily. A vivarium, of at least four feet long, 2 feet tall and 2 feet front to back will house one individual comfortably, a pair at a push – it’s recommended to give more room. They are an active diurnal species, generally terrestrial, but will climb dry stone walls and branches from time to time in the wild. For this reason it is suggested climbing items are provided in the vivarium. At least two hides should be provided, one in a cooler area of the vivarium, one in a warmer area (but never heated directly). Digging is sometimes observed in the wild, and a substrate that allows various levels of dampness, such as ProRep DesertLife soil mixes are ideal. The lower levels should be maintained a little damper, is it would be in natural conditions. Real plants are unlikely to survive in this type of enclosure, and with this species – for this reason we suggest plastic foliage. A water and food bowl completes the vivaria décor. Lighting should be provided by a T5 high output reptile fluorescent tube, such as Zoo Meds T5HO Reptisun 10. This light will provide the levels of Uvb required for this species, but unlike the cheaper T8 version will also provide full spectrum light at a high level of luminance. Heating must be overhead, as this species basks in sunlight, this can be provided by basking incandescent bulbs, but is better provided by a ceramic heater. Ensure this is placed at one side of the vivarium so there is a hot end cool end to allow for thermoregulation. A thermostat must be utilised to control the heat output, a daytime temperature in the hot end of 32C and dropping by around 10-12C at night is ideal for this species. 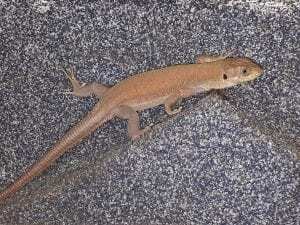 Diet is the usual lizard fare of a varied insect diet – commercially available locusts, cockroaches, crickets, morio etc are all readily taken. Gut load the insects with a livefood diet (such as ProRep Bug Grub), and always dust the insects with a good quality reptile vitamin and mineral supplement (such as Nutrobal). Larger adults will also take pinkie and sometimes even fuzzy mice as an occasional treat. We highly recommend this lizard species, they are attractive, personable and ideal for the slightly more experienced keeper.